The customisation options with this template are endless, and it comes with a quickstart package allowing you to copy the demo in just a few clicks. There are various slideshow backgrounds to choose from which add to the beautiful effect of this Joomla template. You can also choose your colour, your font and your logo type from the template manager screen. This responsive Joomla template is easy to use, and comes with the standard Joomzilla options and module positions. As you can see from the demo there are multiple layout options, click on home2 or home3 to see just a few. This template also features just 3 additional extensions, that are all included with your purchase. As this is a donations/charity themed template there is a very useful PayPal donations module included, which you can see at the bottom of the demo. Socal Media integration is featured heavily in this template, with in bui;t Facebook and Twitter Sharing buttons that can be activated in the template options. Also links to your favorite social media sites can be activated and they feature in 2 fixed positions in this template. 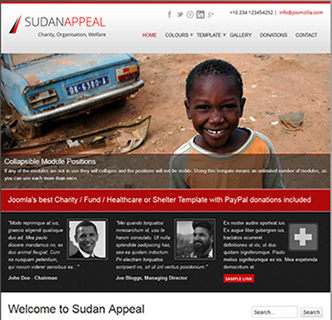 Click on the link below to view this superb Joomla Boostrap template, available for Joomla 2.5 and upwards.